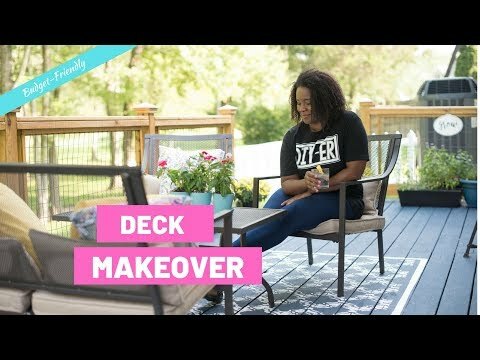 Budget-friendly deck makeover. Get ideas and inspirations for your outdoor space this summer. Create the best place to host that 4th of July and Memorial Weekend BBQs. Or just get some design inspiration for outdoor decorating and creating an outdoor room. Need a helping hand with your DIY project or inspiration on your next DIY project? We’re always uploading new videos, so whatever your project, we’re here to support you 24/7. Oh, it's beautiful! I love the blue and the 'rug' you stenciled is gorgeous! The rails are just wonderful. Much better than before. Great job on the makeover! The only thing I'd suggest is that you get some pretty pots that contrast with the blue, and put your plants in them to make a container garden. Then group them around your deck. That is another deck from another house , it doesnt remind the old at all ,I AM AMAZED , love the idea of the rug and the colour of the deck !!!!!!!!!!!!!!!!!!! Great job !!!!!!!!!!!!!!!!!!! !